In the fifth installment from Touchdown Europe, introducing the seven teams competing in the Central European Football League tournament in 2019, Serbia’s Kragujevac Wild Boars trace, in their own words, their history in the competition and also as a founder of American football in Serbia and Eastern Europe. Previously, the Thonon Black Panthers (France), Swarco Raiders (Austria), Koc Rams (Turkey) and Wroclaw Panthers (Poland) have been introduced. The Kragujevac Wild Boars have been known for their consistency in building their organization. In the past few years, they’ve been a complete powerhouse in Serbia, and abroad. In 2017, they managed to reach the CEFL Bowl, however Austria’s SWARCO Raiders was still a too big of a bite to take. It’s interesting to mention that the Wild Boars are the first ever CEFL champions (2006). The first steps in introducing American football to Kragujevac were taken in October 2002, when a group of enthusiasts in this sport, inspired by NFL broadcasts on the Third Channel of RTS, gathered to play the sport themselves. With the arrival of Aleksandar Ćirić and Mladen Pavlović, it went to a higher level, and in mid-August of 2003, the club was officially registered. Then, came the idea that the club will be called Wild Boars, according to an animal that is a symbol of our city. Previously, the club played the first American football game in Serbia, on March 22, 2003, in front of about 500 fans at the stadium of the Kragujevac Football Club Jadran, where the Wild Boars beat Belgrade’s Vukovi, 15-14. The very first official football match in Serbia was played on April 12, 2004, at the FK Sumadija Stadium, where Wild Boars, in front of about 500 spectators, defeated the Nis team by 30: 6 in the first round of the SAFS League. Seven months later, on November 8, at the stadium “Čika Dača”, the first finals were played, while the Boars, in the rain, over 2.500 spectators, defeated the Vukovi 21-6 and thus became the winners of the first championship cup. The following year, the Cup Competition was played, and Wild Boars furiously reached the finals, defeating all the opponents apart from Nis Steeds in regular part of season. However in the play-offs, @ Nis, Kragujevac entered the most historic victory – 102-6. But that year the Wild Boars did not win the trophy, because in the final, after a series of 11 victories, they suffered the first defeat since founding, from Vukovi, at the FK Obilić stadium – 20-7. Shortly thereafter came the equipment in Kragujevac, and in 2006 the first season with equipment was played in the South-eastern League of American Football, in which, besides the domestic clubs, Silverhawks from Ljubljana participated. Kragujevac finished the league with a record of 7-2, and in the final they returned to play and defeat Vukovi- 20-7, at FK Radnički stadium in New Belgrade, in front of about 2,000 fans. Then came the shift of generations in the 2007 season, which was the worst in club history. The Wild Boars were back triumphantly in 2008, when they were the first to hire players from America, quarterback Stan Bedwell. In the 2009 season, the Wild Boars were even more convincing as they marched through the league with a record of 9-0 and defended the title. That season marked a debut appearance in European competitions under the auspices of the EFAF (European Federation of American Football), where they got to the semifinals, but due to visas getting rejected, they could not travel to Hungary. Season 2010 ended without a defeat in the Serbian league. The Wild Boars won their fifth title in Serbia with a victory in the final against the Cacak Angel Warriors – 69:-6. After a successful performance in the Challenge Cup, Kragujevac took participation in the EFAF Cup, where they were first defeated by the Swiss Calanda Broncos, later winners of this competition and the champions of Europe from 2012, and then defeated the Italian Lazio Marines. Good games on the domestic and international scene brought Wild Boars placement to the 17th position on the list of the best clubs in Europe, which was the first time a Serbian team was found on the EFAF list of TOP 20 teams. Even though they did not win the title in the 2011 season, the Wild Boars scored the biggest club success in the history of this sport in Serbia, playing in the final of the EFAF Cup. The Kragujevac team did not mind that all the matches in this competition were played on the road, riding bus for more than 10,000 kilometers. First they beat the favored legion of foreigners, Austria’s Cineplexx Blue Devils from Hohenems, in the west of Austria (51-7), then followed with a win over the Black Panthers from Thonon, a French town on the banks of the Lake Geneva (34-22), in order to lose from London Blitz in the finals (29:7), in a match where they were without suspended American Brian Peyton, and at the same time, QB Stan Bedwell was also injured. The Wild Boars walked through the Super League, registering all eight victories, but they were defeated by Vukovi -51-36 in the final without injured Bedwell. After this season, the Boars took 10th place among the TOP 10 European teams. Season 2012. The Boars ended with seven victories and two losses – both losses at the hands of Vukovi. The final played in Ada was one of the most exciting in the history of Serbian Bowl. Boars were leading at half-time by 24-21, but the home team Vukovi finally celebrated with a 35-24 win. 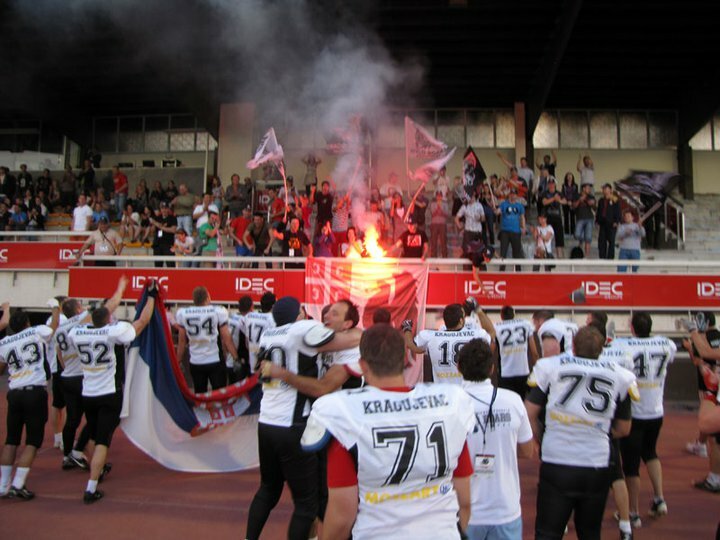 In the 2013 season, Kragujevac finished third in the regular season (5-2), but in the semifinals returned to play the Dukes @ Novi Sad following a defeat in the last round, and won another berth in the Serbian Bowl. However, in the final, which was also CEFL Bowl, because previously these two teams were ranked first in the regular part, Belgrade SBB Vukovi were better. The Wild Boars were runners up in the 2014 season. This time they offered much stronger resistance to Vukovi, even leading in the first quarter, but failed to win the title, as Belgrade finally celebrated with a 27-17 win. In the regular part of the CEFL, Veprovi, Vukovi and Ljubljana Silverhawks were equal to 4-2, but because of the weaker points, Kragujevac players lost the final. The 2015 season, accompanied by numerous issues, was one of the most turbulent in the history of team. However, they managed to reach the third consecutive semi-finals against the Dukes, but in the thrilling duel the Dukes were more successful (21-14), and then went on to win the first title. The year of 2016 brought a number of changes. As the Wild Boars season, they were getting better and eventually deserved to return to the throne, with a convincing win over the Vukovi in Belgrade – 53-29. Phenomenal performances brought them back to the European elite, and after a few breaks, they ended up again on American Football International’s TOP 20 best clubs of the old continent, this time in the 18th position. The 2017 season was probably the most successful in clubs history. Defending the championship title and adding the seventh national championship trophy, the Wild Boars made a comeback in a great way. First, they finished the regular season with a perfect 7-0 record, and then in the semi-finals defeated the Indjija Indians 50-3 and then won the Serbian title, beating Novi Sad Dukes 24-16 at Cika Daca stadium. They were exceptionally successful on the international scene, where they defeated Turkey’s Koc Rams 21-14. followed by a win over Hungary’s Budapest Cowbells 50-15 and went to the finals to face Vukovi. In CEFL Bowl they faced their biggest test in the history of the Serbian club football team and, despite having had to satisfy the name of the vice-champion, they lost to one of the most successful European clubs, the Swarco Raiders, the triple champion of Europe, at a beautiful “Tivoli” stadium in Innsbruck. In the middle of the season, the Wild Boars were on the list of American Football International’s TOP 20 teams of Europe, but after losing to the Austrians they ended the year in 16th place. This past season, 2018, was an easy march through the Serbian league, but in Istanbul we lost in shoot-out to the Koc Rams which cost us an appearance in another CEFL bowl. After we won a home game against the Moscow Patriots, we didn’t give up, hoping that maybe the Patriots would win over the Rams at home, but that didn’t happen. We took that lesson, like every team should do, and didn’t lose our step in remainder of season, when we awarded our effort with an 8th Serbian title in the Serbian Bowl, with win over Vukovi, 54-36. That made it 3 times in row. The first equipment arrived in Serbia in 2005. with the equipment in Serbia came coach Larry Kentera, former coach of Arizona Sun Devils and Northern Arizona Lumberjacks, who influenced the future development of our club. From that moment on, we are constantly improving our coaches at clinics. We can boast that our head coach and offensive coordinator is also the Legend of American football in Serbia, Aleksandar Ristic, popular Alf, while our defensive coordinator Predrag Scekic is one of the best LBs in Serbia. By bringing players and coaches from the United States, we have raised the level of football in Serbia. For 7 years we played our games in the field of the soccer club “Sušica”, after which we moved to the “Čika Dača”, where we are still playing matches. We plan to build a stadium and we have already started the process with the city administration in Kragujevac. In addition to our domestic competition, we will also participate in the CEFL, which, according to the structure of the teams, is one of the strongest leagues in Europe. Our team is a large family, we try to always be together both in good and bad. We often organize together to go to the cinema or theater. In training pauses, we often participate in recreational sports, which positively influences our team spirit. Lost games are an integral part of the sport, we exit much stronger from each defeat. We showed this best in 2008 when we won the title after a very bad season in the previous year. We organize sports clinics where we improve our players and raise team spirit. We try to mark and celebrate the success of every individual off the field as a club. There are currently two projects we are working on. The first one concerns the construction of a stadium for American football, which would be the first stadium in Serbia. The second project refers to the formation of a sports federation that includes more sports. Right now, besides the American football, we have a futsal (indoor soccer) and a baseball team. We have good support from the city of Kragujevac. There’s a team of people on the team board dealing with finding sponsors. 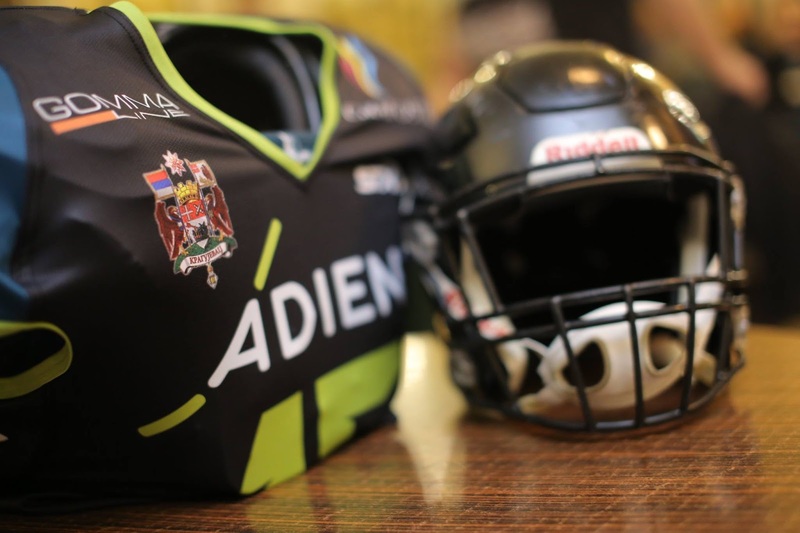 Our brand is very well recognized both in Serbia and in Europe, as evidenced by the fact that in 2010 we have consistently been on American Football International’s list of top 20 teams. Which makes it easier for us to reach new players and people who are ready to help the club. Our history may not be as long of a history like other big names of European football, we learned that every year is new year, and its even harder then previous one especially if you defending championship. It’s easy to win one, but harder to defend it. We managed to do that twice, and we are working to do it again. There are always some minor mistakes, some may seem bigger, and there will always be some. It’s a part of growing as a organization and brand in this part of Europe. We tend to be better each day than we were at the same time last year. Even we have role models in some teams as some perfect looking organizations we are trying to create our own legacy and show that we can stand hand in hand with top of Europe.